How We Healed My Son’s Eczema Rash Quickly… without changing his diet! I love that boy and I praise God at how far you and he have come. Thank you for the effort you have put into my grandsons and the rest of us and our health. Keep up the good work, Jaclyn! On a similar journey here! Confused on how to give oregano orally? Have been rubbing it on him. What do I mix it with so my son can ingest without the discomfort? Also, this article uses the word “cure” but I read that you are still in a cycle of supplements and setbacks. I have yet to hear of anyone actually stepping out of controlling symptoms into a healed state of being. I wonder about the hope of curing our children instead of this life of watching and waiting. Praying with all parents who are struggling. I don’t understand why you didn’t just give him an antibiotic when you found the strep. You could have replenished the “good” bacteria with probiotics once he completed the treatment. I think it would’ve saved you years of a horrible struggle for your entire family. It’s not like you’re giving him antibiotics every day but they do have their use especially with something as serious as strep. Hi Cathy. We didn’t know about the strep until years after the fact. Since writing this article, I have found alternatives that work well against strep bacteria. However, since his original infection did not present as a typical strep infection, I had no idea that’s what it was at the time. There is no way of knowing if they would’ve had any long-term benefits had we used antibiotics during the original illness. There are plenty of kids who take antibiotics for strep and still end up with PANDAS. My son has PANDAS and had chronic strep for years. We had him constantly on antibiotics and it never fully went away until we alternated Goldenseal and Oil of Oregano. Now gone for good! We also did probiotics. It is a highly resistant bacteria, esp. the one that is in the Pneumonia vaccines, which he had when he was little. Then he passed on this lovely infection to his brother, who never had the shot. 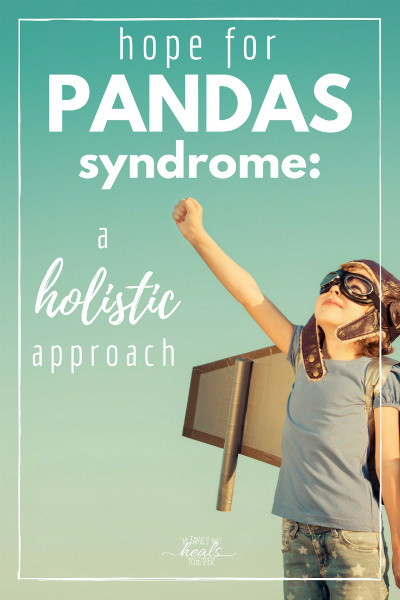 I believe my daughter has PANDAS, no definite diagnosis yet, but she started with anorexia, then OCD, than tics, bed-wetting, ODD and now rage and psychosis. They are going to do a blood test to test for strep, but will that reveal if she has strep in her gut like your son had? What tests confirmed his condition as they have said her white blood cell count was not elevated and no current infection is suspected. Any help you can provide is much appreciated………she is currently on psych meds unfortunately, as anything you can share would be appreciated. There are two strep blood tests that can be used to test for PANDAS. My son’s strep was found via stool testing. Check the link at the top of my homepage for my free e-books, one of which is about PANDAS. Hope that helps! Hi Amie. Initially, I did the treatment for about 3 weeks, then about a month later, did it for another few weeks. I also used a supplement called “happy” from BioRay kids the second time and the ODD and unreasonable anger had never returned. We’re doing another round now to help with hyperactivity. Do you believe the protocol you used for your son would work for a kid with PANS, as opposed to PANDAS? Thank you so much for your response! Oh also, is this the supplement from Bioray called ‘happy’ you mentioned? I can’t find one called, ‘happy’………. Would you mind telling me what brand of oregano you used, and how you used it?? Thank you for your article! Hi Lisa. It should be linked in the post. I use one from Gaia herbs, and we put it in a little water. Hope that helps! omg. That is one that knocked out strep in my son, in capsule form. That stuff works! use it! Did you use Happy at the same time as oregano? I think so. I’ve used it off and on, and it has helped me with some chronic infections. Hi John. I’m finding I need to keep him on the supplements long-term to continue getting results. Hi Jaclyn.Thanks for you reply.Did you find Biocidin helpful? Have you been using this long term? I thought I saw you had used it but can’t see it mentioned now for some reason.Thank you. Yes, we are using Biocidin at this time as well. Just a couple drops 2-3 times/day. Thanks for your article I was meant to say. Hi! Thank you for all this useful information! I have clicked on the links for all of the above supplements… are the capsules all able to be poured out and mixed with water or something so I can give them to my son? Thank you! Hey Courtney. You can open pretty much any capsule to mix into something for younger kiddos, though I haven’t done that with these, so I can’t attest to the taste! Would Oregano oil work or just the tincture? I don’t know, Anne. I haven’t tried it, but it’s definitely not the same thing, and I don’t recommend routinely taking essential oils internally. Hi; I have a couple questions regarding the protocol you did. The Oregano leaf tincture; how did you give that? My son is 3.5 so I’m having great difficulties in getting him to take all the icky tasting herbs/supps. I just put extracts in a little water, but for strong tasting herbs, I’ve been known to mix with some raw honey for my little ones. You can put herbal tinctures into empty capsules if your child takes capsules. I’m in tears. I’ve battled my daughter for years and always blamed myself. This all makes sense. We used a tincture called Oregano Spirits and put the drops in a little water. We did this off and on for several months and still go back to it on occasion if there is a flare. hi, my child was diagnosed with PANDAS and I want to try your protocal. I just need more clarification on the doses. The oregino; how many drops of the oregino tincture did you put in juice? The DE powder you gave him right away 1 tablespoon or you slowly went up in amount? Does the child need to drink lots of water when taking this powder? (because I know that the bentinote powder you need ti drink lots of water and I am wonering if this one you need too.) How many exact drops did you give from the Intestinal Tract Defense.? For what reason did you also give this? The DE powder is not strong enough? Hi Maria. Everything we did, we started slowly with small amounts and worked our way up, however, I cannot tell you what doses might be appropriate for your child, as this is just what worked for us. 🙂 One should drink lots of water when consuming DE, yes. How do you use diamatacious earth? Like how much and do you mix it with something? When I’m using DE, I’ll mix a teaspoon up to a tablespoon (though generally not that much for a child) in a little water, then follow up with a full glass of water. How long do you continue the DE? Does your son continue to take it? We only do about two weeks at a time and are not currently taking it. How much oregano extract did you give? You may have said but I can’t find it ?. I think my son has Pandas and I am looking for a physician to test him. Can you tell me what stool test you used to detect the strep in his gut? It was from Genova Diagnostics. Hi Belynda. I don’t recommend internal essential oil usage in general. I have used it as part of a combination tincture, however, but not for extended periods of time. As I read this, everything you described felt like you were describing my son. He will be 6 in April and has an diagnosis of mood disorder. I have always felt like he had Pandas since he was 3. He had hand foot and mouth otherwise know as coxsackie, but he had to be hospitalized. Looking back on it I think it was impetigo a skin version of strep. We have seen problems ever since. This post gave some much help and hope for his future. Hi Jessica! I’m glad this might give you a place to start and have hope for your son! Hello! I am crying re-reading this blog post. I first found it two weeks ago in my never-ending quest to heal my son. He has been on a GAPS/paleo, corn-, MSG-, and sugar-free diet since age 4 . At first he was markedly improved but then slowly he progressively got worse in every way. I have tried every supplement in the book, done thousands of dollars in testing (23&me, genetic genie, methylation profiles, toxicity profiles, organic acids, hair minerals, regular blood panels, etc), seen therapists, seen psychiatrists, consulted multiple experts and doctors locally and remotely, and have had NOTHING work until now. Last week I started the Oregano Oil and already my 7-year old son with severe ADHD and ODD (who had been in suicidal screaming rages at school just the other week) is remarkably calmer and less defiant. It’s incredible and I am cautiously optimistic for the first time in years about a possible recovery. I cannot thank you enough for putting this information out into the world. I will continue to follow your guidelines and I’m just so grateful. Thank you. Wow Jennifer! Thank you so much for sharing. Praying for continued success for your son. This is interesting. You never did clarify in your post or in your replies to others (who specifically ask for the information) about what dosage of oregano oil you used for your son. It sort of seems like you are avoiding the question, or maybe you just aren’t sure… Is there any reason you do not want to provide the answer? What dosage did you use, and for how long? Obviously everyone’s child is different but maybe it would be helpful for people to have a sort of baseline idea of what worked for someone else. It’s not that I’m avoiding the question, it’s just that there are too many variables, and I’m not legally allowed to “prescribe” dosages. The dosage I’ve given my son varies. Sometimes he tolerates only a few drops, and sometimes I give him a full dropper more than once in a day. 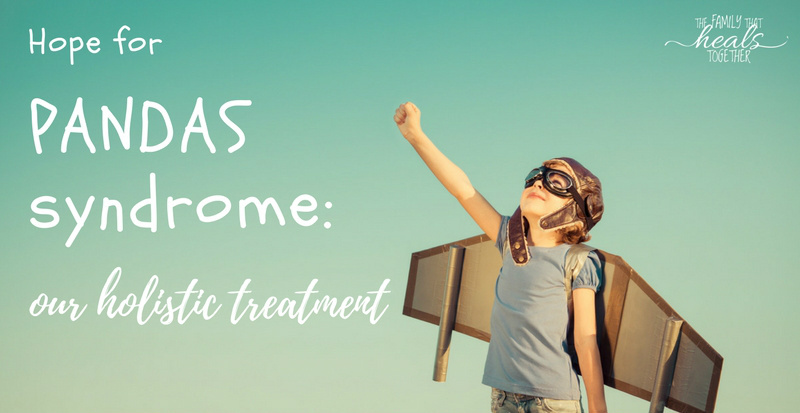 It’s very important to start very slowly to see how your child tolerates any supplement, but the end goal should be to work up to a therapeutic dosage. What that is for each individual, however, will differ, especially as the dosage on the bottle is probably designed for an adult. Hi! How do you test for PANDAS? How do you find out if your kid has it or not? What are the steps? New to this…!! Hi , I have twins with Autism that are already nineteen years old but I have purchased everything listed on your protocol. I know you do not feel comfortable suggesting doses after reading through all the comments but can you please let me know How long you should stay on when first starting ? Is it generally two weeks on and so many weeks off? One more question please…when you are eventually wanting to just stay on something as a maintenance dose…what product is the most important to stay on for maintenance? Hi Cheryl, everything will just be very individual for what is working. Generally, the body should get a break here and there from intensive regimens, but sometimes if you stop too soon, symptoms will return, so you’ll just have to experiment.